Nita's Gumbo Makes Fund Raising Oh So Delicious! Hey Chicagoland! If you are or know of any non-profit organizations that love good food and cash back for worthy causes, you must spread the word! Nita's Gumbo wants to pay it forward with Sunday Bless. Yep! When your group comes in to eat on any Sunday, your organization gets 30% cash back from their dining experience (net profits). Click on the link above to get the full Sunday Bless details. This offer is for a limited time at the Country Club Hills location only. Space fills up quickly so don't delay in reserving your group's spot. It has been our pleasure to serve you and look forward to seeing you Chase the Taste for Sunday Bless! Hey Chicagoland! If you thought the food was great, wait 'till you hear the entertainment. 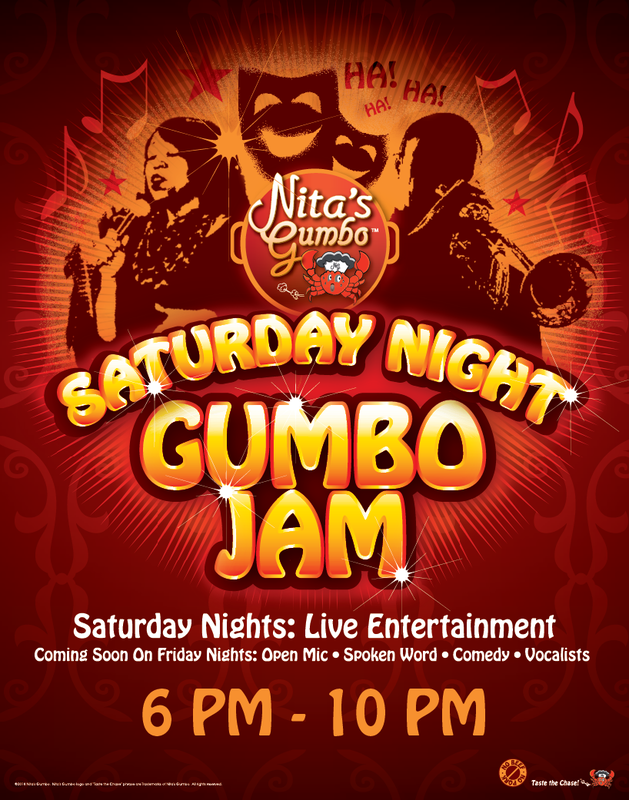 Head on over to Nita's Gumbo on Saturday nights for the new Gumbo Jam (6 PM - 10 PM). Enjoy local jazz artists and vocalists from far and near while you Taste The Chase in the new Country Club Hills location. few of the new tastes Nita's is cooking up. Stop in and try them all. It's perfect for date nights or .....any nights really. You just can't go wrong here. Soon, Friday nights might also kick in with open mics, poetry readings, comedy and more, but for now, get the Gumbo Jam experience every Saturday Night in Country Club Hills. All Chasers welcome! COUNTRY CLUB HILLS LINES UP FOR NITA'S GRAND OPENING! It was a natural BLOW OUT!!! You could barely get in the place. People were in line before the joint even opened. First, the Gumbo was THE Bomb!!! Good grief. When I saw the new Cajun Boil come out, I knew that would be my next choice when I came back. Tried the Gumbo Wings...delicious like everyone has been telling me. Next, the music was great! A perfect addition to such a lively atmosphere, complete with beautiful paintings depicting the soul of New Orleans and Nita's Gumbo. Last, the biggest treat, aside from the phenomenal food, was having Miss Anita Doty, the inspiration and name sake of Nita's Gumbo, present to delight in the festivities, great the guests, and even say a few words. If you missed out, make sure you make your way in to Taste the Chase. Check out the new menu here. No time to sit? No problem. For faster service, try the Express Buffet, hot and ready to fit your on-the-go lifestyle. Remember Nita's Gumbo cooks it fresh and we'll make it worth the wait. Looking forward to seeing you all very soon. Until then, Chase on Chicagoland! 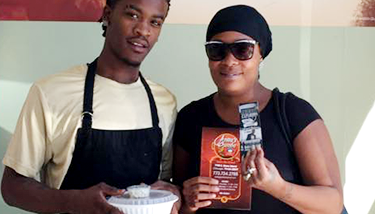 THE BLACK FOODIES GIVE NITA'S LOTS OF LOVE! Dino Dean sits down with Anita Doty to learn about Nita's Gumbo history. 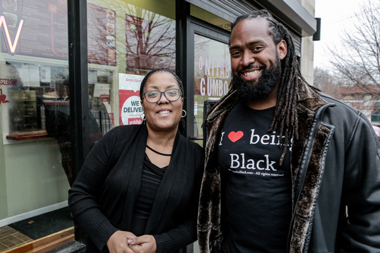 The Black Foodies, Dino Dean and Miss Corettta, stopped by the new Country Club Hills location and spent some time Tasting the Chase with THE Anita Doty. From Nita's Signature Gumbo to Shrimp and Grits and Chicken Po' Boys, The Black Foodies didn't hold back telling it like it is. 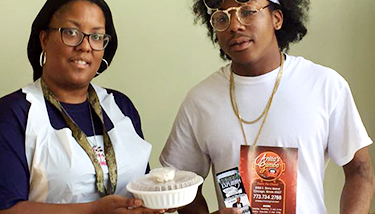 See what they both had to say about Nita's delicious dishes. Thank you Black Foodies! We appreciate you visiting us and look forward to having you back soon! If you're not following them yet, you should. Check them out on You Tube for more tantalizing delights throughout Chicagoland. The Black Foodies give their review after the Chase!! HUNGRY BLACK MAN SAYS NITA'S WINS! The Hungry Black Man, food critic extraordinaire, hung out with the crew, and sampled some of Nita’s Gumbo. So gracious in his thoughtful article, you'll laugh out loud when you read his review. Click here and find out what The Hungry Black Man had to say about Nita's Gumbo. Thank you Hungry Black Man for allowing Nita’s Gumbo to surprise you for lunch. Feel free to come on back and Taste the Chase anytime. Be sure to follow The Hungry Black Man and his food adventures at thehungryblackman.com. 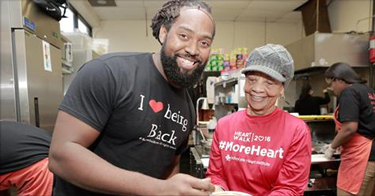 The Hungry Black Man beams with Nita's Gumbo namesake, Anita Dotty. Cynjora Ross, Manager, and The Hungry Black Man outside Nita's Gumbo. POWER 92 BRINGS "THE CHASE" TO THE STREET! Tune in to Power 92.3 from 7 to 10PM every Sunday for your chance to win a free bowl of Nita's Signature Gumbo, and two tickets to Raw TV Radio Comedy Explosion starring Michael Blackson!!!! Thank you WPWX! We're grateful for your participation in spreading the word!! Follow Nita's Gumbo on Facebook and see who wins next ... it could be you! Congratulations to Ashley King on her 2 tickets & Gumbo...another winner!! 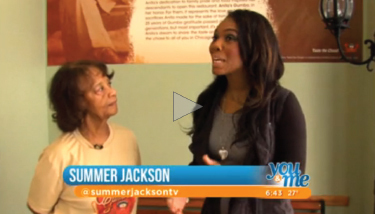 WCIU’s SUMMER JACKSON CHASES TASTE, NO WASTE! Summer Jackson, segment producer and on-air contributor for "You & Me This Morning”, stopped by and spent a little time with Anita, the crew, and sampled some of Nita’s Gumbo tasty delights. When asked about how Anita achieved her signature gumbo taste, Ms. Jackson got quite the response. Did Anita give any clues to her gumbo recipe? Click here and find out what Anita had to say. Thanks to Summer, Melissa and Jeanne for allowing Nita’s Gumbo to bring the Chase to their place. A great time was had by all. Be sure to tune in every morning to find out what these ladies are up to next! Summer Jackson asks Anita about the secrets to her Signature Gumbo. 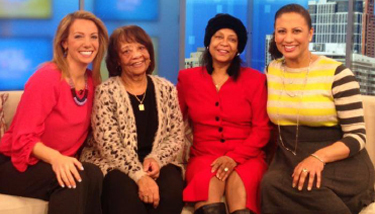 From left to right: Melissa Forman, Anita Dotty, Denise Edge, and Jeanne Sparrow. GET IN THE SPOTLIGHT! Share your favorite Taste Chasing experiences on our Facebook or Twitter page. Each quarter we’ll SPOTLIGHT a new Chaser and award a FREE SIDE to the person, we think, tells the most sincere story. Get creative and have fun with your expression. Are you the next featured Chaser? Come on. We want to hear from you. Find out what people are saying about THE TASTE! It’s why they CHASE.